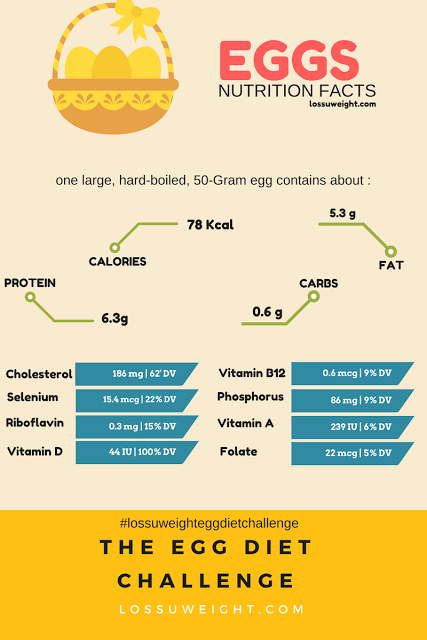 How Boiled eggs can help you lose weight! I’m just like many of you guys, looking and trying many diet, weight loss plans, exercises and more… , I do lose weight yes! but not that weight I wished to lose. after looking, searching and asking I found that egg (boiled) can help you to lose weight! I didn’t know how that is gonna be. but I give it a try. I looked up for EGG DIET and I found a DIET called THE EGG DIET 28 DAY, which you must eat boiled egg at breakfast addition to fruits and other nutrition food. So I took that challenge And I start it. so At that point the first week was hard but it worth it. I felt that I burned some fats. I keep it to the 28 day, And went through the weighing scale and WOW! I didn’t believe it. I lost about 36 pounds in 28 day ! That’s awesome. I was so happy seeing that all weight dropped, and for free! Several studies of overweight women showed that eating eggs instead of bagels increased their feeling of fullness and caused them to consume fewer calories over the next 36 hours. Egg breakfasts have also been shown to cause up to 65% greater weight loss, over 8 weeks (7, 9). This is my story of losing weight! what is yours ? Oh, eggs have so many health benefits! I’m not a fan of eggs though, which is a bummer, since I know they’re so good for you. Loads of protein, quick to prepare, relatively inexpensive - there’s a lot to love about them!